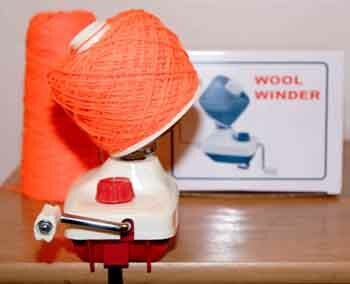 Specialists in all aspects of Brother Knitting Machines. 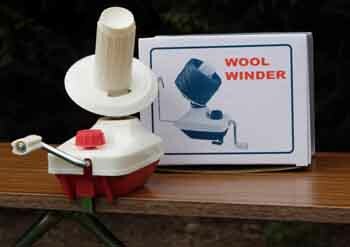 This is one of the most important gadgets that the machine knitter needs. This unit comes with a built in table clamp making it very easy to use. (No yarn supplied. The yarn in the picture is for demonstration purposes only) We have tested this with a 4 ply yarn and a tightly wound ball weighing up to 180gm. Ten blank, 24 Stitch punch cards will fit any of the modern machines, Brother, Knitmaster, Silver Reed & Toyota. You will need to use an appropriate punch. 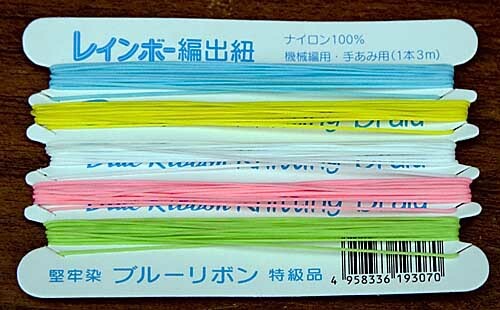 1 x Packet of 10 blank 24 stitch punch cards. 2 x Packet of 10 blank 24 stitch punch cards. This is one of the most important accessories that the machine knitter needs. 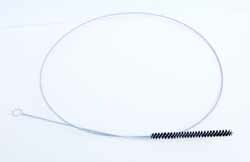 Mainly used when casting on or when running out to waste knitting & making the demarcation to connect the neck band to the work. Five very differant bright colours so that you always have a vivid contrast to help you identify the stitches to pickup. New packets of punch card joining clips. You get two packets of four clips, you need two clips to join one card. 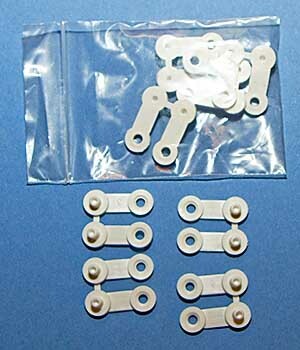 These will fit most of the popular punch card models made. Brother, Knitmaster/ Silver Reed, Toyota. They will NOT fit Passap or Pfaff machines. If in doubt please contact me before you purchase. NEW: 1 x MACHINE KNITTING LONG CLEANING BRUSH 51"
Time to give your machine a spring clean? Then this product is a must. 51" Long machine knitting cleaning brush, should just reach the length of the average machine up to a chunky KH260 (please measure before you try it). It will allow you to remove the fluff from under the needles. Care should be taken when using this product you can damage the machine if you are heavy handed, to be safe it is advisable to remove the needles before using this brush. It is advisable that before you use the product you remove the ring on the end of the brush, it is liable to get caught up in the inside of your machine but be careful that you don't leave a sharp end that could be dangerous. NEW: TWO WAY MAST SET FOR THE BROTHER MACHINES WITH THE GARTER CARRIAGE ATTACHMENT. NEW: A TWO WAY COMPLETE MAST WILL FIT MOST BROTHER MACHINES. Payment: We accept PayPal, UK Cheques, Postal Orders & we take most credit cards.